Lightning Strike Cluster is a Reminder that the Threat of a Fire is Ever-Present, says Fire Protection Group, Inc. 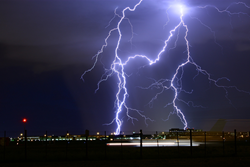 The consulting group comments on a recent article that residential and business properties alike need to be fully fire safe, because lightning can literally strike at any moment. Even the most carefully conceived fire prevention efforts can be trumped by Mother Nature. While there are ways to prevent blazes before they start, fire is always a possibility and, as in this case, can come from a literal bolt from the blue. An August 8 article on SF Gate reports on a cluster of over 3,000 lightning strikes that hit a number of largely rural counties in Northern California. Among other incidents, a bolt hit a power pole, causing a power surge, which caused a television set to explode, and started a fire in a neighboring residence. Los Angeles based consulting firm Fire Protection Group, Inc. says that the incident, which followed a similar cluster in Southern California several days prior, is a sobering reminder of the ever-present risk of a fire. The firm adds that, while there are ways to prevent blazes before they start, fire is always a possibility and, as in this case, can come from a literal bolt from the blue. That’s why it’s necessary not only to try and prevent fires from getting started, but it’s equally important to minimize the potential threat to lives and property, says Fire Protection Group, Inc. The firm notes that there are many aspects to making a building more fire safe. Such measures as fire sprinklers and fire escapes are often necessary, and large multistory buildings also often require standpipes to ensure that firefighters are able to access water on the higher floors. The firms notes that there are a great many decisions to make in the process of securing a property, such as whether to purchase a Viking sprinkler system or a competing product. Other issues include determining the exact placement of fire extinguishers in a large building, while being up to applicable codes and as fire safe as possible. The key, says Fire Protection Group Inc. is to have the benefit of experienced hands who understand the ins-and-outs of protecting a residential or business property in every way possible. The consulting firm says that its leadership team includes some of the most respected names in the Los Angeles fire protection community. It notes that its general manager and lead engineer is George Saadian, a respected expert and author in the field, who has personally helped to revise many of the fire codes that are currently in place. The firm’s team also includes two well-known veterans of the Los Angeles Fire Department, retired chief Al Hernandez and Captain Bob Holloway, formerly a leader in the department’s construction services division. Fire Protection Group Inc. concludes by noting that protecting lives and property from the threat of a fire is an extremely serious matter, and it’s always best to have the help of people who really understand what’s involved. Individuals who would like learn more about Fire Protection Group, Inc. are invited to call (888) 251-3488, or they can visit the firm’s website at http://www.firesprinkler.com/.